I’ve been by this place dozens of times but did not notice it until yesterday. Normally I wouldn’t be in this area two days in a row, but I drove past it again and had to stop and take a closer look. Quite obviously, this is not a beautiful building by any standard or measure. It’s small, has obviously not been used in years, and sits completely enclosed behind a barbed wire fence. As churches go, from an aesthetic point of view, this place is little more than a shack. But I’m drawn to it because I know that if it could talk, it would have stories to tell. When was it built? How many babies were baptized there? How many couples married inside those walls? What did its people believe and how did they worship God? Why did it close? Did the congregation simply die off? Was there a church split? Hi! I just came across your blog today and really like it. I live in Livonia, since last November, and would like to know where this is located. There are quite a few churches in my community (I live near 6 Mile and Middlebelt) and rather than joining a specific church I had decided to go to many different ones as well, Thank you for writing your blog, I enjoy it tremendously. If you like trying out different churches, there are so many in the area to choose from. It’s not hard to find a church in the Livonia area, that’s for sure. 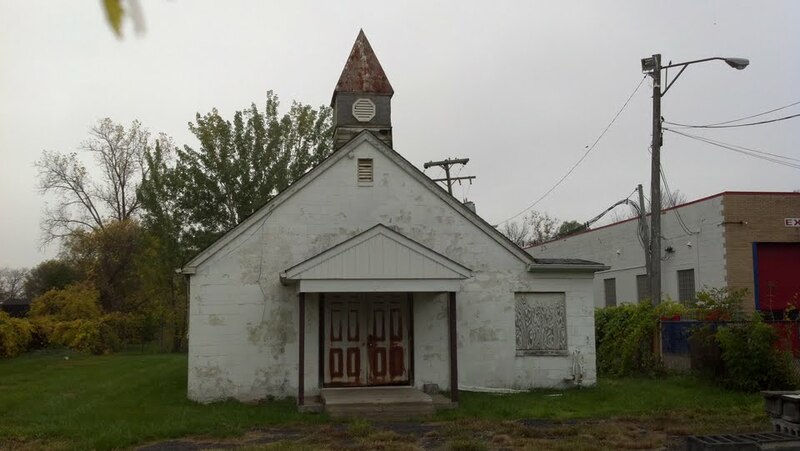 Have you found out any information yet regarding this church? No, unfortunately I have not. I really didn’t do much digging after I published this post. If you find out anything, feel free to share.